This article was originally written by Ryan Young and was first posted on isdhoops.com. It has been republished with the author’s permission. Driving down Interstate 80 on another bleak, frigid December day last winter, the Iowa State basketball players knew they were heading into their first real test of the season. The Cyclones, led by coach Fred Hoiberg, who now coaches the Chicago Bulls, were on their way to a sold-out Carver-Hawkeye Arena for the annual CyHawk game — yet they faced an uphill battle even before the opening tip. Senior Bryce Dejean-Jones, who had transferred from the University of Nevada-Las Vegas for his final year of eligibility, had been arrested at his west Ames apartment the night before and was facing a drug-related charge and two excessive noise charges. While the charges were eventually dropped, Dejean-Jones — who was the team’s second-leading scorer, averaging more than 17 points per game — would be kept off of the hardwood against the University of Iowa. The Cyclones needed someone to step up. The redshirt junior forward dropped 19 points and grabbed six rebounds in the game, leading No. 14 Iowa State to a convincing, 90-75 win over its instate rival. Nader went 6 of 10 from the field and 4 of 6 from behind the 3-point line. More importantly, Nader scored seven points during the Cyclones’ 18-0 second-half run that blew the game open, sealing the CyHawk victory. The rest of the season for Nader didn’t go quite as well as that Iowa game. Nader, who saw action in nearly every contest, averaged 5.8 points and 2.9 rebounds per game. 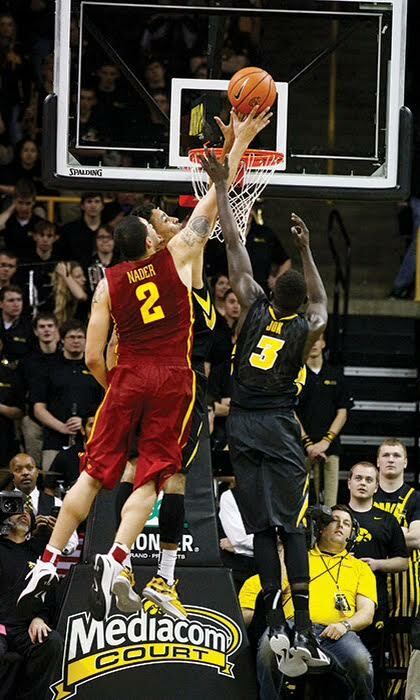 Before the Iowa game, Nader was averaging 4.4 points per game. But he didn’t let that shake his confidence heading into what might have been the biggest non-conference matchup of the year for the Cyclones. Nader averaged single-digit figures through the season but was still able to have big games like the one in Iowa City that cold December Friday last year. Yet some might still call Nader too hot and cold. “I think the misunderstanding with people is that they think I’m inconsistent, but I think it’s more like we were loaded last year,” Nader said. “We had some senior guys that were ahead of me. I’m not saying I’m mad about it or anything, but I took advantage of the opportunities that were given to me. 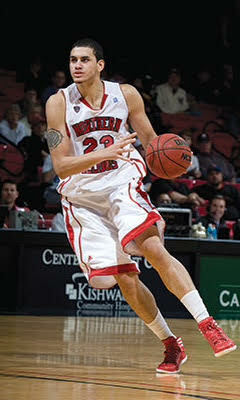 Nader hails from Skokie, Illinois, a northern suburb of Chicago, where he attended Niles North High School for the latter half of his prep career. Heading into his freshman year of high school, Nader’s basketball experience was extremely limited. He had started playing the game about a year before. Glenn Olson, his high school coach, placed Nader on the freshman team. Nader’s game grew exponentially during that first year. By the start of his sophomore season, Olson said, Nader was a completely different player. When he started his junior season at Niles North, the team thrived when Nader thrived. But Olson said he wasn’t all of the way there yet. It was during his senior season when Nader made his mark on the Chicagoland basketball world. He averaged 23.8 points, 8.6 rebounds and 2.8 assists per game, leading the Vikings to a Central Suburban League title and a sectional championship — their first in school history. Nader garnered First Team All-State honors from the Chicago Tribune, earned Chicago Sun-Times Class 4A Second Team All-State recognition and was named to the ESPN Chicago All-Area team. But what truly impressed Olson was the fact that Nader accomplished this while still fairly new to the game. AAU basketball teams have turned the sport into a year-round pursuit, with kids of all ages traveling across town and across the country every weekend to play in hundreds of games each year. Nader didn’t have that background. With his statewide accolades and the numbers to back them up, it’s no wonder he was being recruited by some of the nation’s top programs. Nader had picked up interest from Marquette, Oklahoma State, Ole Miss, Illinois and Florida, among others. Nader’s original plan was to join coach Steve Alford at New Mexico, a program to which he verbally committed during his junior year. But Nader had doubts about his early decision to join the Lobos, and he had some issues in the classroom, too. In a move that shocked the recruiting world, Nader signed with Northern Illinois — a school about 90 minutes from his home. Todd Townsend, an assistant coach at NIU at the time, said location was one of the main reasons the Huskies were able to sign Nader. At the time, NIU basketball was struggling. During the 2010-2011 season — one year before Nader’s arrival — the Huskies finished with a 9-21 record, winning only five games in the Mid-American Conference. Ricardo Patton was in his final year as head coach, with only 35 wins to his credit during a four-year tenure. Mark Montgomery was hired to replace Patton, and with him arrived an incredibly talented freshman class — headlined by Nader. But the infusion of youth didn’t equal wins. NIU finished with a 5-26 record that year. However, the team did defeat defending conference champion Eastern Michigan in the first round of the MAC Tournament, marking the program’s first tournament victory since 2003. Nader’s impact was immediately felt. He led the team in scoring during his first year with 10.4 points, playing 24.2 minutes per game. Nader and the rest of the freshmen accounted for about 56 percent of minutes played for the Huskies that year, the sixth-highest percentage in the country. Nader was named to the MAC All-Freshman team after the 2011-2012 season, making him the first NIU player to earn that honor since 2009. Yet Nader, who had turned 18 just before the start of his freshman season, wasn’t sure at the outset that he would have as big of a role as he did. Nader returned to Northern Illinois for his sophomore year, but he quickly hit a bump in the road. He was suspended before the 2012-2013 season for what Montgomery said was a violation of team rules, and he sat out the first seven games of the season. When Nader returned to the court, the team still struggled. He led the team once again with 13.1 points and 5.6 rebounds per game, yet the Huskies won just five games again that season. And, as the season wrapped up, the road for Nader remained rocky. He left the team before the end of the season, saying only that he needed to step back to take care of personal issues. Nader then took to the transfer market in search of a new home. Right before he was set to go on a pair of visits to Michigan and Marquette, Nader got a call from Matt Abdelmassih, an Iowa State assistant at the time, who convinced Nader to make the trip to Ames for his first visit. Upon arrival, Nader said, he felt right at home. Per NCAA transfer regulations, Nader was not eligible to play for the Cyclones right away. Forced to sit out a year, Nader took to the gym. He wasn’t alone, though. Jameel McKay, who had transferred from Marquette, and Kourtlin Jackson, who was redshirting that season, joined Nader on the sidelines — something Nader said helped immensely. “It was real hard, especially with all the success that [the team] was having,” Nader said. “I would have loved to play with that team, and I know [McKay] would have probably said the same. It helped that Jameel was sitting out with me, and I think [Jackson] was, too, so we were here when they were away just working out and stuff. That helped a lot. Entering this season, not a whole lot has changed for the Iowa State basketball team. Sure, head coach Steve Prohm is now holding the reins and attempting to continue what Hoiberg started, but much remains the same. Georges Niang, Jameel McKay and Naz Mitrou-Long join Nader in filling out this year’s senior class, and junior Monté Morris returns as one of the best point guards in the nation. The Cyclones are once again ranked in the top 10 — No. 7 in the USA Today preseason poll — and are among the favorites to make it to Houston for the Final Four in April. But a lot needs to happen for the Cyclones to make it that far. It will take a team effort, Prohm said, and a big impact from Nader, too. At the team’s media day this fall, Prohm said Nader had the “inside track” to a starting spot. And whether he plays from the first whistle or comes off the bench, Nader will bring something unique to the table, Niang said. During the offseason, Townsend said he noticed a change in Nader. Physically, Nader embraced the process. He was consistently in the gym and running at 7 a.m. daily. Since last season, Nader has lost about 15 or 20 pounds. But Townsend took more notice of what changed between the ears — something he credits to Nader’s supporting cast. “It’s really because of his teammates,” Townsend said. “Abdel talks so highly about those guys, how they’ve taken him under their wing. When he mopes, especially last year, they never gave up on him. The bad body language, there’s less and less of that. Olson has noticed a change, too, especially since Nader joined the Cyclones. Like many of his teammates, Nader’s ultimate goal is to play in the NBA. When looking at the Cyclones, Nader even appears to be one of the more NBA-ready guys on the team. But for now, Nader is pushing that to the back of his mind. And while people have questioned Nader’s maturity in the past, assistant coach T.J. Otzelberger said that isn’t an issue anymore. As this is Nader’s last shot on a college basketball court, Otzelberger has already seen a change. No matter what impact Nader has on the team this season, one thing is clear: He has made quite an impression on his teammates and coaches this summer.